Many health-conscious people exercise regularly, and some use sports drinks for hydration. While it’s true that sports drinks help preserve electrolyte levels in the body and pose fewer health risks than energy drinks, their acidity can erode tooth enamel affecting oral health in Davidson. And when tooth enamel is compromised, those pearly whites are more prone to staining, discoloration, and decay. Nobody wants stained teeth, so next time you’re at the gym try substituting your sports drink for water. 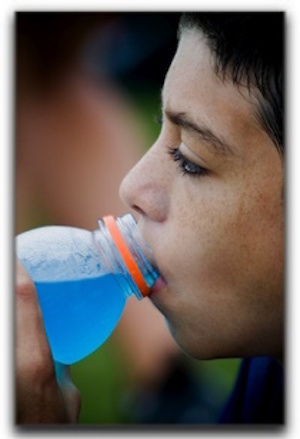 Are Your Teeth Stained from Sports Drinks? If you have already discovered staining or tooth discoloration and would like to know more about porcelain veneers or teeth whitening, give Dennis J Coleman DDS – Family & Cosmetic Dentistry a call at 704-896-5850. We are an acclaimed dental practice that offers services such as cosmetic dentistry, dental implants, and dentures for our patients in the area. Don’t let stained teeth affect your life. Come into our office and ask us about in-office and over-the-counter teeth whitening kits which could restore your smile’s beauty. Patients who have come to us for information about teeth whitening always leave feeling more confident about their smile. Dr. Dennis Coleman has been providing high-quality dental care since 2015. Although we are a fairly new practice, our office is teeming with experienced dental professionals. The caring staff here can answer any questions you have about important preventative oral care and cosmetic dentistry care such as dental veneers, gum contouring, invisible braces, tooth-colored fillings, and smile makeovers. We can also help you improve your oral health in Davidson, so give us a call today to learn more. You can reach us at 704-896-5850. We look forward to hearing from you!